The Denver-based Colorado Legacy Land, which has been in negotiations with Cotter since July, received a conditional approval from the Colorado Department of Public Health and Environment on Nov. 8 to take over the defunct uranium mill’s radioactive materials license. Mine near Golden. The project, included in the same transaction as the Cañon City site, still needs a mine permit transfer from the Colorado Division of Reclamation, Mining and Safety. The company also met with the Colorado Attorney General’s Office and Environmental Protection Agency attorneys to get assigned an administrative order on consent. That process also is still pending. 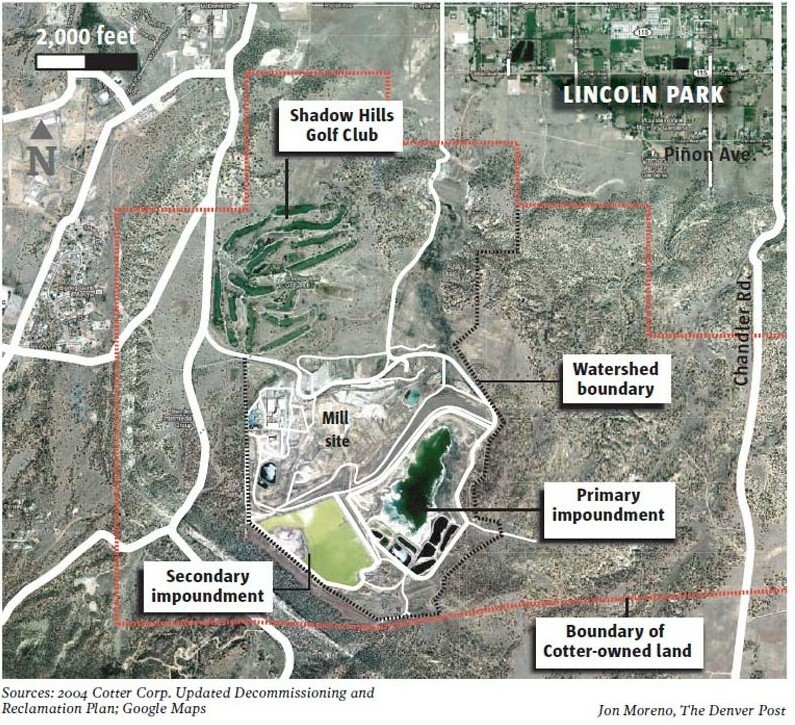 As part of requirements outlined in the CDPHE’s conditional license approval, Colorado Legacy Land will need to inform the department of the closing date in writing. 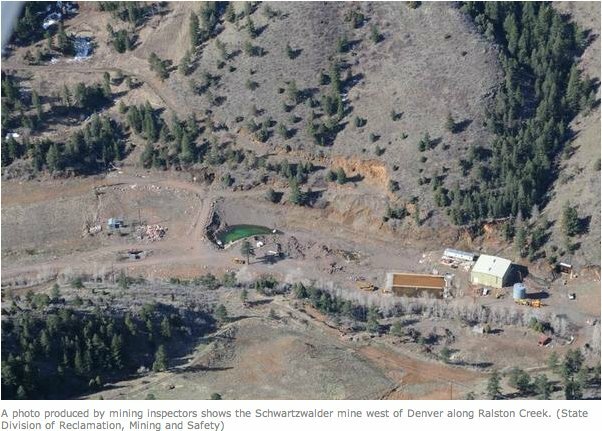 Cañon City community members will meet again with Cotter Corp. on Thursday to hear about the former uranium mining company’s pilot groundwater cleanup project. Cotter hopes the project will reduce uranium and molybdenum contaminates to safe levels, but so far, community members have had mixed feelings about the effectiveness of the program. The project proposes an organic method using wet hardwood mulch to remove contaminates from the groundwater, rather than synthetic chemicals that most uranium mills use. The mulch, Cotter believes, would remove oxygen from water flow areas, causing the uranium to separate from the water. Because the water is migrating down slope through the mulch, Cotter anticipates successful contamination reduction using the natural aquifer as opposed to a mechanically propelled system. “This is the simpler solution based on our tests, and sometimes the simple solution is the better solution,” Cotter project manager Steve Cohen said, adding that capital costs for this type of project are much lower than synthetic chemical-based ones. Community Advisory Group member Carol Dunn said she does not know enough about the details of the project to make an assessment. 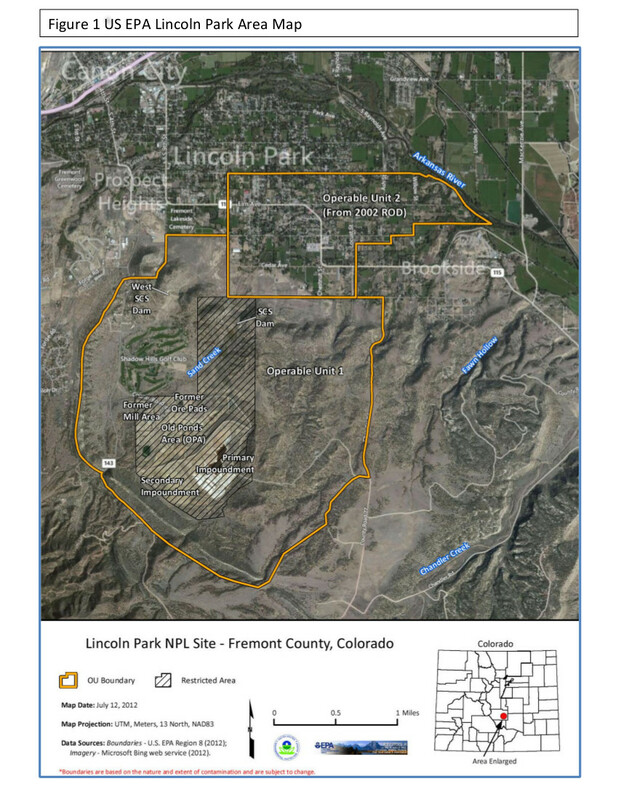 The project is in the informal public comment period, which was extended by the Colorado Department of Public Health and Environment from April 21 to May 7 last week after a request from the Community Advisory Group. The EPA and CDPHE – which oversees activities at the site because of its designation as a Superfund site in 1984 – are reviewing the details of the project and will provide comments following the May 7 comment deadline. The EPA is currently administering its 5-year review of the site to ensure that the site decision remedies are continuing to protect human health and the surrounding environment. The Community Advisory Group also has contributed to that project, providing the EPA with people to interview in the community about the impacts, or lack thereof, of the remaining contamination. Colorado Department of Public Health officials on Friday received a report of a spill that occurred at the Cotter Crop. Uranium Mill south of here. Steve Cohen, Cotter manager, reported the spill occurred just before 8:30 a.m. as Cotter workers were trying to drain a section of pipes that connect the new and the old pipeline. A new pipeline is being installed to prevent contaminated water escaping the site. About 5,200 gallons of water was spilled, all of which was contained within the trench and Cotter workers were able to recover most of the spilled water using a water truck, said Warren Smith, health department spokesman. It’s unclear how much “slightly contaminated” water seeped into the ground or will evaporate, but Steve Cohen, Cotter’s plant manager estimates around 3,000 to 4,000 gallons were picked up with the truck. The valve will be replaced, Cohen added. The water was contained in the trench where pipeline construction has been ongoing for the last couple of weeks. Now, the water will return to the impoundment pond on Cotter property. Cotter is replacing the pipeline after several leaks the last couple of years. Last August, Cotter reported a 7,000-gallon leak, which occurred over the course of 48 hours. That leak was the result of a hairline fracture in the pipleline — which is now being replaced on site. Despite the most recent spill, Cohen said the pipeline replacement is still on track to finish the final week of March. Cotter is required by Colorado law to report spills to the Colorado Department of Public Health and Environment, which posts the information on its website. CDPHE is expecting a report on the spill next week. Cotter Corp. Uranium mill officials say a leak that dumped about 7,200 gallons of contaminated water on the mill property was caused by a rock that punctured a hole in a feeder line. The feeder line connects to the main pumpback pipeline above a Soil Conservation Service dam that helps prevent rainwater runoff from leaving the mill site. The pipeline carries contaminated water that seeps past the earthen dam and returns it to an impoundment. “When Cotter personnel excavated the area of the leak, a large rock was discovered above the feeder line. The rock had punctured the pipe, causing the leak,” said Stephen Cohen, Cotter Mill manager. “Because the puncture and associated crack were small, only a relatively minor percentage of the total actually leaked. Most of the flow continued into the pumpback pipeline,” he explained. Cotter maintains a pressure monitoring system on the pumpback pipeline that deactivates pumps in the event of a sudden, large pressure drop. However, the feeder is isolated from the main pressure monitoring system, Cohen said. The leak could have occurred on Saturday and continued for 48 hours until workers discovered it on Monday. It is believed that none of the contaminated water seeped off the mill site, according to Warren Smith, a state health department spokesman. Cotter officials are replacing the broken section of pipe and the feeder line should be reactivated today, Cohen said. The main pumpback system continues to operate, Smith said. Because leaks formed in the main pipeline on two separate occasions late last year, Cotter and state health officials are working to finalize a proposal to build a new pipeline. “Cotter’s original plan does not include replacing any feeder lines. Because this line has broken, however, company (officials) plan to replace this entire section of feeder line when they replace the main pipeline,” Smith said. 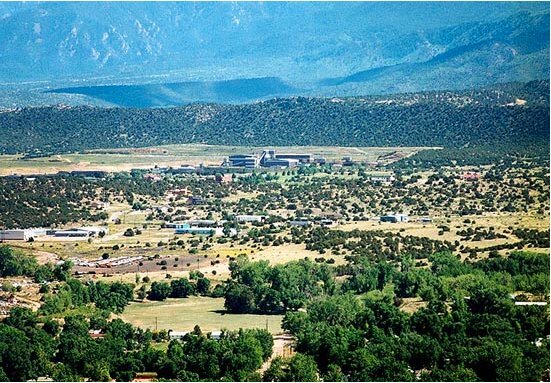 Federal and state health officials also are working with Cotter representatives to come up with a plan to clean up and decommission the now-defunct uranium mill site. 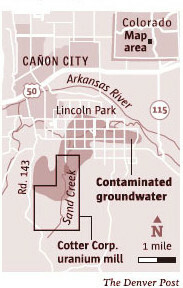 Has the Lincoln Park/Cotter Mill groundwater reached Pueblo Reservoir? Pueblo County Commissioner Liane “Buffie” McFadyen is calling for sediment testing along the Arkansas River and at the bottom of Lake Pueblo to see if there is possible contamination from the now-closed Cotter Corp. Uranium Mill in Fremont County. However, state health officials say the concerns are unfounded. But McFadyen remains concerned. “This has been going on for 40 years and we can see that the situation is not getting any better and it’s time for us downstream from Canon City to take a stand,” McFadyen said, referring to the ongoing battle over the Cotter Mill cleanup. Jeri Fry, director of the Colorado Citizens Against Toxic Waste Inc., shared the history of the Cotter controversy and presented maps from a 1987-89 study sowing ground uranium and molybdenum plumes that stretch from the Cotter Superfund site toward the Arkansas River. However, the concerns are unfounded, according to Colorado Department of Public Health Public Information Officer Warren Smith and Cotter Corp. Mill Manager Steve Cohen. They agree that Arkansas River water is not impacted by contamination from the Cotter mill. “The Arkansas River is sampled routinely and the results have been showing that the river water quality has not been impacted,” Smith said. Both state and federal health officials study the data and “nobody has ever found anything to suggest that,” said Cohen. “I am personally disgusted that the Pueblo County commissioners would have a meeting about this and not invite us to speak on the topic,” Cohen said. “This issue and all other potential issues will be looked at as part of the remedial investigation as we work toward final cleanup,” she said. McFadyen said in 1986, the USGS suggested on behalf of the federal government that sediment and not only the water be tested in the Pueblo reservoir. “With the plume growing toward the Arkansas River, it’s time. It’s time to take action,” McFadyen said. She said the possible contamination also could affect Colorado Springs because of the Southern Delivery System, which pipes water from Lake Pueblo up to that community. State health officials overseeing the Cotter Corp. mill have not felt the study of Minnequa and Pueblo reservoir water quality pertinent since 2004. “A 2004 review of water quality of the (Minnequa and Pueblo) reservoirs as well as the Arkansas River and associated drainages concluded that they are not impacted by the mill contaminants,” Smith said. Part of the reason that the downstream reservoirs have not been tested since 2004 is due to the absence of high levels of radium-226, thoium-230, molybdenum and nickel in bodies of water much closer to the mill. “Sediment sampling in Sand Creek (just north of the mill site), the Arkansas River and the Fremont Ditch indicate that constituents of concern are similar to (natural) background data. These locations are closer to the mill than the Pueblo reservoir and the Minnequa Reservoir,” the state health review concluded. While the legacy contamination is still present in Lincoln Park groundwater plume (though declining), remedial measures have been effective in preventing public exposure to the Lincoln Park plume. A 2008 water use survey concluded that only one Lincoln Park water well exceeded a drinking water standard for contamination. The Agency for Toxic Substances and Disease Registry draft public health assessment in 2010, conducted at the request of Colorado Citizen’s Against Toxic Waste, found that Cotter contamination did not present a current threat to human health or the environment, according to state health documentation. “We need to understand all of the materials and how they are moving through the groundwater and how after these 30-40 years they have reached the river and if they are moving on downstream,” Fry said. “This site is leaking into the neighboring community and it has contaminated the wells and it is a slow moving problem and because of that, people aren’t aware of it,” Fry said. Fry is calling for more testing of water near the site and they’re looking for help from the community. “Until we know where it is, we can’t realistically, effectively clean it up,” she said. She fears the waste may have spread downstream through the Arkansas River and to the Pueblo Reservoir, which has caught the attention of Pueblo County Commissioner Buffie McFadyen. “I do believe it’s time for Pueblo to get involved and work with the citizens of Fremont County to not only demand a remediation plan that’s realistic to cleanup the site, but also to demand testing along the Arkansas in the sediment and in Pueblo Reservoir,” she said. McFadyen, now also demanding more testing of the sediment specifically. And the possibility of tainted water is unsettling to some locals in Pueblo. “This water comes from the same area, I imagine it passes through, so it’s picking up stuff definitely,” Patricia Hitchcock, a Pueblo resident said. While others say, this isn’t anything to worry about just yet. “I think there’s always a little bit of concern about stuff in the water, it wouldn’t keep me out unless it was really serious, but a little bit of concern. In 10 years, I haven’t gotten sick once from the water,” Daniel Rottinghaus, a Pueblo kayaker said. Cotter officials tell News5 these claims of contamination in the Arkansas River are simply not true and that they routinely test the water and sediment. Tuesday morning, Colorado Citizens Against Toxic Waste gave a presentation to commissioners about their suspicions that the toxic substances have leaked into Pueblo Reservoir. Why should we in Colorado Springs care? Because one source of water for Colorado Springs and Fountain is the Pueblo Reservoir, via the Fountain Valley Authority line and the Southern Delivery System pipeline. Commissioner Liane “Buffie” McFadyen is, Pueblo County Commissioner is overseeing efforts to learn more about the situation. Here’s a community newsletter about the issue. And here’s a presentation made today by the citizen group. After two recent breaks in the Cotter Corp. Uranium Mill’s pumpback pipeline which returns contaminated water to an impoundment, officials on Friday outlined a plan to replace 3,500 feet of the pipeline. Cotter officials reported two leaks occurring at the end of November and in early December in a pipeline that captures contaminated water that seeps past an earthen dam on Cotter Corp. Uranium Mill. It appears that both times the leaks were contained to Cotter property, according to Warren Smith of the Colorado Department of Public Health. The now-defunct mill is undergoing the decommissioning process as health officials decide how best to safely retire the site. The pipeline proposal can be seen at http://recycle4colorado.ipower.com/Cotter/docspubreview.htm.